One of the recurring themes for this year’s reviews is the high quality output from our commonwealth friends Canada. Alongside the many fine releases being received are an ever increasing number of tours being undertaken to the UK and the latest artists to cross our paths are the west coast duo Dustin Bentall and Kendel Carson. Keen followers of country, roots and Americana music will be aware of Kendel who through her twin albums, association with Chip Taylor and plugging from Bob Harris, enjoyed some UK coverage a couple of years ago. Well the good news is she’s back and keen to re-engage with the UK as well as introducing us to her musical collaborator Dustin Bentall. 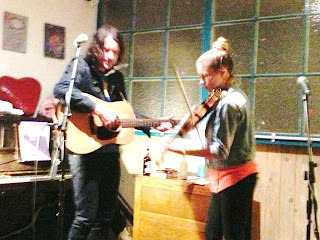 In what can be described as a low key Birmingham gig at the slightly eccentric Ort Café, an enthusiastic audience was treated to a set predominantly designed to feature Dustin’s material with Kendel offering her trademark fiddle input and backing vocals. Although she did take centre stage to deliver ‘Oh Baby Lie Down’ and ‘Ten Lost Men’ from her 2009 album ALRIGHT DYNAMITE, as well as providing a final treat to the delight of certain audience members. 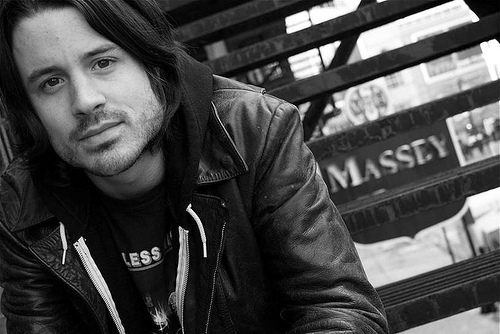 Dustin Bentall hails from a musical family in Vancouver, British Columbia and possesses a style that flirts between country, its alt spin off and wider Americana (a term which seems so inappropriate for Canadian music). He has worked alongside respected Canadian artists such as Kathleen Edwards and recently supported the fantastic Lindi Ortega on some North American dates. The songs he showcased during the set ranged from numbers from his 2010 album SIX SHOOTER including the title track, ‘Three Thousand Miles’ and ‘Pontiac’, through some interesting covers to a couple of yet to be recorded gems. For somebody who declares his Cosmic American music love in his online bio, it was no surprise to hear ‘Sin City’ added to the set, while a more left field cover version was an Arthur Alexander song ‘Anna (Go To Him)’ which was also featured on The Beatles 1962 album PLEASE PLEASE ME. One of the stand-out songs which Dustin shared during this intimate evening was an excellent country influenced effort titled ‘Nine Inch Nails’, a 2008 country song of the year at the Independent Music Awards of North America. However this fine song was eclipsed by an unrecorded demo track, ‘Good Money’ that has been tracked down to this Sound Cloud link. This is definitely a song that warrants a new lease of life. Another superb song worth a mention was a new one called ‘I Have Not Been Sleeping’. All that was left was for Kendel to fulfil the request to play the quirky yet delightful sing along ditty ‘I Like Trucks’ which was heavily featured on Bob Harris’s Country Show a number of years ago. This simple but effective tune has an endearing quality that ensures its listening will never tire willing ears. It was a pleasure to hear it live along with her talented fiddle playing. Dustin Bentall and Kendel Carson have the potential to become popular and regular additions to the UK circuit which embraces their music. So now the word is out and hopefully increased positive press will help raise their profile to fund future trips. The value their music adds will be more than welcome.